I am continually amazed by all of the talented people we have working at this museum. There are so many interesting stories and discoveries made here, but the stories of the people who uncover them are just as fun to hear about. Since it is Women’s History Month, I thought it would be a great idea to interview the women of the Department of Anthropology, and have them tell you more about themselves and their work. So far, I’ve talked with two amazing scientists, Melinda Zeder, Senior Research Scientist and Curator of Old World Archaeology and Archaeozoology; and Kari Bruwelheide, Museum Specialist in Skeletal Biology. Both women have shown me that they share similar experiences and outlooks, even though their research has taken them into very different (but complementary) specialties within anthropology. In their interviews, both Melinda Zeder and Kari Bruwelheide underscored that the Smithsonian has incomparable collections and resources for research that continue to yield discoveries into the present day; both have found the Smithsonian a very supportive workplace for women scientists to grow in; having kids while doing science can be challenging but rewarding; and both want to go to Antarctica someday! This last commonality may seem random, but I think it represents the far-reaching goals of the kinds of people who come to work here. They always want to go to unexplored places, both in the world and of the mind. Both are problem-solvers, who take their work to the edges of the discipline, and push its boundaries farther as they make new discoveries. In short, the women scientists of the Smithsonian are seriously amazing, and I can’t wait to hear more of their stories. While we work on typing up the interviews, please submit any questions you have about the work of our female scientists (including linguists, physical anthropologists, cultural anthropologists, and archaeologists), museum collections management professionals, archivists, and others here in the Department of Anthropology. In the meantime, I will continue to talk to a variety of the women who work here, and continue to share their insights with you. Stay tuned! Until then, can you name this historical Smithsonian anthropologist? Tweet us your answer @archaeologylab, or comment below! Bonus points for naming her major research focus! Did Mayan civilization collapse? Did it just go through a major change? Or did the Maya hit their resilience threshold which caused them to stop building elaborate cities, among other things? Whatever this process is defined as, we can say that the Maya moved away from those cities, broke up large trade routes, and ceased to function as a massive, unified network of trading partners. If you approach this situation like many past scholars, it’s a total collapse of society. 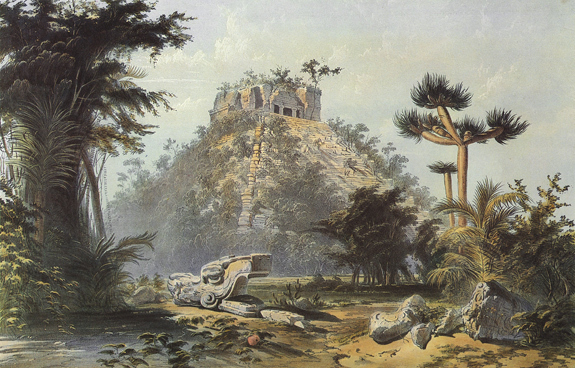 The resilient Mayan society failed to maintain the golden standard of a vast and prosperous civilization. The Romans also suffered a fall from glory after centuries of growth and adaptation. The end of the Roman Empire plunged the entirety of Western Europe into the Dark Ages. If we look at large-scale, hierarchical societies in decline it seems at first that a loss of resilience might equal total failure—as the word collapse suggests—but there is more to it than meets the eye. The Course of Empire Destruction (1836), by Thomas Cole. Source: Wikipedia. Resilience is about absorbing small stresses without disrupting the overall stability of a system; however as the Maya, the Romans, and modern day climate change all suggest, the resiliency threshold will be crossed at some point. Nothing in nature can stay in a state of permanent stasis. Many people believe that resilience is the end goal because it is supposed to keep a system intact in the face of change, but crossing the threshold and shifting to a different state is an essential part of the system. Nothing lasts forever, and even when sweeping change involves entire societies or the climate, it may still all be part of a larger, adaptive system, known as panarchy (Gunderson and Holling 2002). Fig. 1. 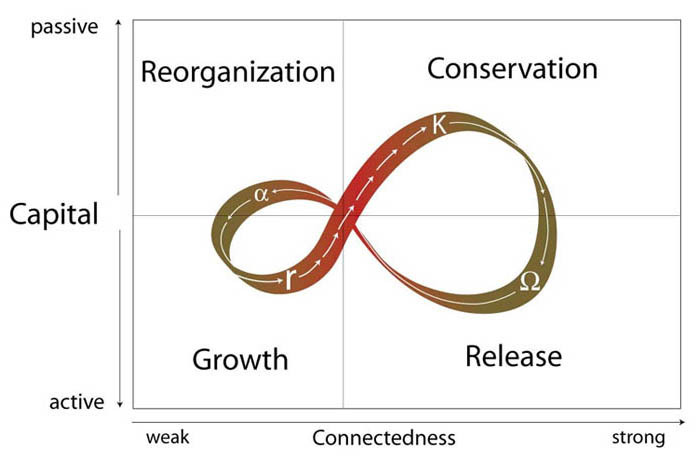 The adaptive cycle (Holling 1986); temporal changes in a system proceed through phases of growth (r), conservation (k), release (Ω), and reorganization (α). The adaptive cycle is an effective model for systems, the levels in a panarchy, and the dynamics of individual systems. Source: Cambridge University Press. In panarchy, a shift from the stable state to an additional state is the first step in a continual process of rejuvenation, creation, and growth. The system is a perpetual cycle that draws from adaptive resilience and places it into a larger context. While the cycle is perpetual, adaptation and resilience depend on a variety of circumstances. The theories of resilience and panarchy are applicable to many disciplines and some have argued that they also apply to change in human societies. The panarchy idea was developed in ecology, first as an adaptive cycle, so I will explain panarchy in that context. A good example is the growth of forests over time. Start in the “r” or growth phase of panarchy, where a variety of species grow in a forest over time. This growth eventually reaches a fairly stable, resilient state, where the levels of trees and other plants even out at a sustainable point. This would be the conservation or “K” phase of the cycle, where trees and plants die at a natural rate, and are replaced by others like them at a steady interval. Even with a stable ecosystem, there are stressors. Too many new animals in the ecosystem, altering seed levels, or dead flora that can’t decompose fast enough to provide nutrients to the new plants trying to grow. Under such stress, the system may appear stable, but will become brittle and move closer to the threshold where a shift occurs. That shift could be brought on by any number of scenarios such as virulent disease, logging, fire, etc. All of these would be viewed as terribly destructive processes by humans, who might believe there is no good that can come from these situations; but in reality only logging would be quite so damaging to the forest ecosystem, depending on the circumstances. Natural “disasters” like disease or fire are actually part of the cycle and fall into the release or “Ω” phase of the system. This means that all of the potential that has been accumulating in the conservation phase is suddenly available for use. A fire is a type of threshold trigger, and by burning up many of the species in the forest, it is clearing dead fauna, releasing nutrients back into the soil, and helping to disperse seeds quickly. With all of these formerly trapped resources now available, the forest will enter the “α” or reorganization phase, and new plants— ones particularly suited to survive the fire conditions— will begin to grow, which starts the cycle all over again. This new growth is the same building-up process as the first time the system ran its course, but the fire caused a change in the type of plants that are growing. The forest may still reach a stable state through new plant growth; it’s just not exactly the same as the one before. Image of an area reaching a new stable state ten years after a forest fire. Source: Oregon State University. The U.S. Forest Service has an entire division that deals with managing the resilience of forest ecosystems in relation to serious stressors, like fire. The system they employ is one that actually pulls inspiration from the natural cycle just described, and it allows humans to help maintain a healthy forest. This theory of management within a natural adaptive cycle can be applied to many areas outside of ecology, and the NSF grant (Cyber-Enabled Understanding of Complexity in Socio-Ecological Systems Using Computational Thinking) we are working on is one such area. Many important leaders in the discussion involving climate change are trying to find ways to keep societies and the climate in their current state. If efforts made today follow this path, then societies the world over will only become more brittle and increasingly subject to environmental disasters, rather than capable of finding the resilient adaptations we seek. The same adaptive cycles that produce panarchy over time as applied to ecological and social systems can also apply to ideas. Panarchy can be used to develop adaptive management strategies for socio-environmental problems in the near future. Source. Societies, like a forest, can’t just stay in one state forever because the resources available won’t match the needs of the inhabitants. This is already the reality facing many societies all over the world, and by examining how these theories work, our current NSF-funded project hopes to better understand how people deal with climate change, and how they might continue to do so in the future. Climate change and continued population growth are going to have strong impacts on resource availability on a local, national, and global scale, so now is the time to develop adaptive management strategies for use in the near future. By looking to how past societies adjusted to changes of all kinds in their worlds, and how a particular ecosystem regulates itself, there is a chance to find solutions to the brittleness of many modern day societies in the face of climate change. Gunderson, Lance H., and C. S. Holling (editors). 2002. Panarchy: understanding transformations in human and natural systems. Island Press, Washington, DC. Resilience Alliance and Santa Fe Institute. 2004. Thresholds and alternate states in ecological and social-ecological systems. Resilience Alliance. (Online.) 6 Nov. 2012.URL: <http://www.resalliance.org/index.php?id=183. Dr. Rogers is currently a CO-PI on a multi-year NSF Grant that models climate change, which we plan to write more about soon. For brief introduction on Agent-Based Modeling, we thought you might like to read Dan's article previously published in our Department of Anthropology's publication, AnthroNotes. If you have never seen this publication, take some time to browse it on the department's website. It has a great variety of articles from the many curators and researchers who work here, as well as experts from outside the Smithsonian! Throughout Earth’s history there have been long periods in which the climate was relatively stable and other periods in which it was constantly changing, sometimes rapidly. Climate, as part of the environment, always has a deep impact on how people live. For a very long time, but especially since the beginning of the Industrial Revolution, people have played a significant role in climate change. As we ponder our options for developing a sustainable future, there is a profound need to understand how people around the world may be able to cope with change. But there is a problem; our information from the past is fuzzy and incomplete. The climatologists, for instance, who build projections for understanding future changes, may have quality weather data extending back only a few decades. Sometimes this information is not enough when we seek to understand trends occurring over the course of centuries. At the National Museum of Natural History some of the scientists are turning to a new way to use the past to see into the future. It is called Agent-Based Modeling, a kind of computer simulation that builds virtual societies in which each individual person, or family, in the simulation behaves according to social norms, but also in autonomous ways, much as real people do. Working with social and computer scientists from George Mason University, Smithsonian anthropologists devised a model of the societies that herd sheep, goats, camels, yaks, and horses on the steppe lands of Central and Inner Asia. Like an elaborate computer game, the agents (people) are born, get married, have children, visit their friends, share with family members who are in trouble, remember their ancestors, and participate in social groups. The agents also deal with problems, like droughts, snow storms, and climate change. Using archaeological, historical, and ethnographic information on herding societies from around the world, each characteristic of the artificial society was painstakingly programmed into the simulation using software called MASON and Java. The first objective was to create an artificial society inspired by the Bronze Age (2000 to 500 B.C.) of Inner Asia. The people of the Bronze Age were members of clans and had leaders we might call chiefs, but not kings. Later, vast empires would emerge from the Inner Asian heart land, culminating in the great Mongol Empire under Genghis Khan in the 13th and 14th centuries. The Bronze Age ancestors of the Mongol Empire are the starting point, a kind of baseline on which to build a history that never happened, but could have. The second objective was to take the replica of the Bronze Age society and actually put time in motion— the clock starts ticking and does not stop for a thousand years. On a very powerful computer this process takes about 2 actual days. The graph on this page shows the population changes for one of the simulated histories. One thing to note right away is that a huge amount of variation and change is the norm. The human population is not even remotely stable, nor does it decline or increase in a gradual way. Change is abrupt and sometimes catastrophic. The thing that accounts for most of this change is weather— snow storms and droughts. In Inner Asia these weather events sometimes kill nearly all of a herder’s animals. When the animals die, the families cease to exist. This catastrophe nearly happened around simulated year 330 (120,000 days) when the population dropped by 50% due to back-to back winter snow storms and summer droughts. Even when climate is changing relatively quickly, as today, what people must adapt to are the extremes. Herders today, just as in the Bronze Age, must find ways to buffer against catastrophes. They can do this by developing a resilient economy. Although they cannot stop the snow storms, they can migrate, share resources, and use other strategies. One of the keys for the herders is having flexible social networks that allow change, rather than adhering to rigid behaviors—a good lesson for us all. One of the reasons we wanted to start this blog was to showcase all of the great collections we work with, that for one reason or another are not on display. In our blog posts over the next few months, one of the things we will be talking about are the collections that come through this lab. As we begin that excursion through a portion of the anthropological collections of the National Museum of Natural History, I want to say a little about why we have these collections. Everyone knows that museums have many more artifacts than they can display at any one time. What you may not know, is that objects have other important uses, even while in storage. The mission for most museums tends to run: collect, preserve, exhibit and educate; and at NMNH we do all that and more. Most of the collections we work with have a research purpose, but that does not rule out the possibility of using a particular piece of pottery or stone tool in a future exhibit or for an educational program. Museums are educational institutions and most have collections that tell a story, or provide the research materials on which a topic is based. For instance, a natural history museum collects, studies, and preserves a portion of the biodiversity of the planet and many also collect, study, and preserve the material evidence of human cultures--artifacts. These artifacts are part of the collective memories of past and present societies. We try to make a difference in the world we share through serious research efforts on a myriad of topics, from airplane bird-strikes, endangered species, climate change, forensics, volcanology, food and sustainability, developing DNA barcoding to help us avoid poisonous foods, to studying the way language shapes how we understand the world and helping to sustain incredible indigenous knowledge through our Recovering Voices Program. Due to our amazing collections, partnerships with other institutions, and other resources, the Smithsonian’s scientists are uniquely able to use what we know about the past to predict what might happen in the future. Stay tuned for more on how Dr. Dan Rogers is working on just such a project together with his colleagues at George Mason University! -Meghan Mulkerin with Dr. J. Daniel Rogers.